After being every year going far away in the winter to exotic places, I’ve decided to change it this year and make a road trip. I left home straight after Christmas without having any clue where I was going. Just driven by the forecast! First stop was in Hyeres, France. Sailing 10days long only 4,0 and if I tried to windsurf on 4,4 it was just for maybe 1h, but than it was too much. The bay of Hyeres is a great place for windsurfing, sailing in on big bay but giving us enough change up to stay motivated to sail whole day long. From big chop to flat water and even some starboard tack jumping. From the moment the wind dropped, and the temperature was going down I headed more south. Meaning to go all the way slowly to Tarifa. Not driving that far without scoring some sessions in new places on the way. sailing around Valencia with some 5.2 thermal wind. 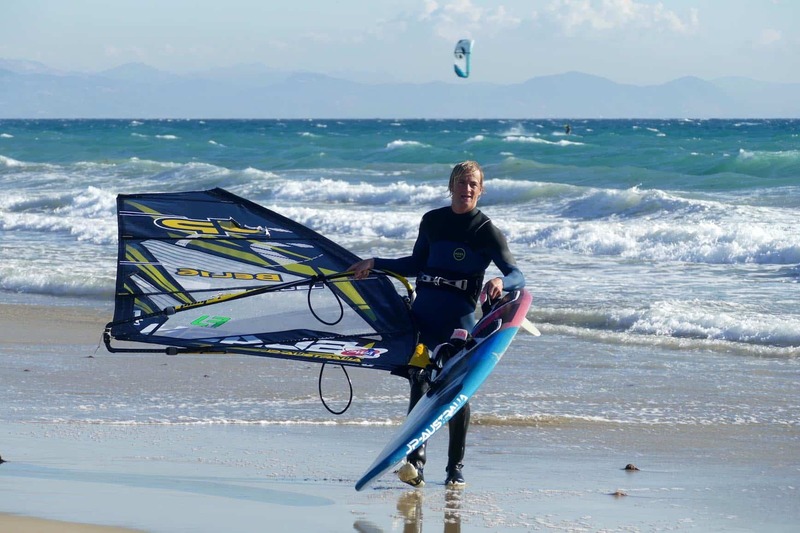 One of the best sessions was in Denia unexpected sailing 3.6 and some waves, freestyle paradise!! Once in Tarifa the training had started for real, sailing with all kind off different conditions and spots. First weeks were mainly with strong Levante, so there are so many options to sail in different locations. Too many to names to list all the spots! But the best sessions where in Playa Chica, it’s a bit Fuerte style of sailing. I also really enjoyed sailing in Palmones, side onshore wind with little waves: another freestyle paradise!! When the Levante disappeared for a while we got the chance for some down the line in Canos and El Palmar, but we didn’t get much rest from freestyling, as the wind got lighter and it was also good on lighter Poniente Winds sailing at Arte Vida for days: a home base. Days with no wind where great opportunity to go mountain biking or paddle surfing. The last week I was in Tarifa, we got a big west storm that normally never happens around there. Big swell and strong wind, I only sailed 3,6 whole week long, great wave conditions but also the storm destroyed the beach what made the perfect freestyle lagoon. When the storm slowly stopped, the forecast turned great for Almerimar (victor Fernandez home spot). Side onshore wind, starboard tack freestyle paradise!!! Morning and afternoon freestyle and finishing the day with a wave session. What can we ask more for?? On my way home I stopped in one of my favourite places Leucate, and scored a nice freestyle session, few session on Lake Garda.. before driving further home. Temperatures? I was not in shorts, but I never had so much wind and variety!